Review: "We use Asana to improve our teamwork and make it excellent!" Asana is used by the organization's teams to communicate with each other and follow up on our tasks for better team performance. Each group that uses Asana is divided, for example, sales team, marketing and design team, salespeople and engineers. This platform has solved different communication problems, and delays in the projects. The best tools of Asana are found once we start a project, since the calendar that is integrated into our mail is super easy to use and we use it as a small agenda. The management of projects is incredible, the monitoring provided is one of the best in its category, since it facilitates group work. The creation and assignment of tasks, notifications and that each person can enter to work no matter where it is since it has a good mobile and web interface. There are not many disadvantages in Asana since its great team has been in charge of improving it constantly, in previous versions it could only be used in English, but now we have several languages to choose from. A point against Asana is that at first it was quite difficult for everyone to adapt to it, it was a long learning process. Asana is a great ally when our team has been under a lot of pressure of work and tasks, we usually pay close attention to the notifications and agenda so we do not miss anything and avoid deliveries of the last minute. It would also not be appropriate to add monitoring tasks hours before delivery, this becomes compulsory. We are aware of maintaining a good atmosphere in the chat rooms because the discussions there are not good at all. Review: "Asana, your solution to workflow in distributed teams"
We use Asana across our design and development teams in a modified dual agile format. It's an incredibly useful and effective tool for communication and information sharing. Implementing Asana helped resolve many communication issues we had between teams around needs, user stories, requirements, the intended implementation, and how the details fit together, both large and small. Cross-team communication is always a challenge, but Asana helps make information transparent and accessible to all members of the team. It's easy to share with individuals outside of the organization and still control the flow of information. Being able to link in other design resources like InVision prototypes is a huge time saver. Integrating with Slack makes much of our necessary communication automatic. Asana does a lot, so it can sometimes be hard to find the right place to be to find the tools you need. Organization is only as good as you make it and just because a system makes sense to the person that creates it does not mean it will make sense to anyone else. It can be challenging to find the information you need via search. Asana Review: "Can't recommend enough!" Asana is our project management system of choice and it's used throughout the whole organization. My team is remote so all of our projects go into Asana for collaboration and project management. We used to manage projects on paper and other less adequate options and eventually moved to Basecamp. Basecamp treated us well but we outgrew it. We were particularly looking for software that would allow us to have dependent tasks. Considering my team is remote, this feature became fundamental fast enough. Asana ended up being our choice and we couldn't be happier. We are more effective, work faster and in a far more organized way. I can't recommend it enough! Nothing to note, really. We love it! I can not be happier. My team was using Basecamp but we outgrew it. We moved to Teamwork and clients stopped using it and so did my team. We were in Teamwork for just a month and decided we needed something better. We then found Asana and it has been a breeze since. My team was far happier and ready to use it and my clients started interacting with it again. It is simple to use, yet very powerful. Asana Review: "Project Management Made Easy"
Asana has been my solution for streamlining project management and remote communications. Since Asana is being used as a project management app, we're able to better handle deadlines and assigning responsibilities. We limit usage to internal communications only, as to not overwhelm clients. Majorly used for marketing and communications efforts. Asana is an amazing tool for deadline and tasks scheduling. Being able to assign team members tasks, setting due dates and being able to manage all communications in one place is a game changer. The biggest area for improvement would be the "task" home page views. Right now, there is no way to change the default view setting for tasks. I prefer to have everything in due-date order, but the moment you switch out of the screen, that view is lost. Asana is best suited for task-oriented team communications. When managing lots of deadlines and specific job functions within the team, the layout and easy UX helps more tasks get done on time. However, I've seen Asana used in incorrect ways too. Asana should not be used as a brain dump tool or a notes app. Because things can get easily lost when they haven't been assigned to a person. Asana: "Great for Non-Profit's Program Management and Fundraising Strategy"
Asana is being used by our project management and program management team within our organization. We use it primarily to organize our programs but have a few important grant deadlines and other tasks within the organization as well. Attaches links and comments to tasks. Reminders are too frequent, but when you turn them off our staff doesn't use the tool. Allows project managers to delete and remove tasks without approval from a supervisor. Duplication tool works well, but still has some functionality that could be improved. It is well suited within our non-profit organization for program and project management because it allows our staff to collaborate on the programs and see what tasks each person is taking and their progress without having to reinvent the task list each time. It also allows us to track our grants and corporate sponsorship strategy well, which is an annual task that we can greatly benefit from having the information from one year to the next. User Review: "Asana - Task Management Made Simple"
Asana is currently used by several teams to manage a large number of requests coming in on a daily basis. It allows us to all stay on the same page and have any relevant details available at our fingertips instead of buried in our inbox. Easy task additions from email to specific projects. Chain of custody for tasks is easy to keep track of. Multiple team members can easily contribute to a specific task without negatively impacting workflow and efficiency. Sort tasks by creation date; tasks are automatically sorted with newest on top and oldest on the bottom. Giving the option to inverse this would be a welcome QOL update. Allow tasks added by email integration to be assigned to specific project sections to minimize admin clean up. Asana is best suited for organizing projects/tasks that have multiple players, who may have varying details within their own silos. Allowing those players to come together and bridge their work into a cohesive whole is a welcome improvement to workflow efficiency. Review: "Asana: not good, has potential with a lot of work." We used to use Asana to tackle three different problems: project management mapping, task assignment for marketing, and workflow management among senior leaders. We started using it within specific departments before launching it to the entire team to be used cross-company. Ease of use to people with varying levels of technology proficiency. Controlling who can add/delete tasks isn’t available. Someone can delete tasks with permission and it isn’t auditable. User interface is clunky at times, especially when working on multiple items. Sometimes things just disappear or don’t save. Customer service isn’t stellar. They are email only and often aren’t clear in their response. I think Asana would only be good for small teams of 1 to 3 people. Once we rolled it out to many users, it became hard to manage each person’s role and what they could add or delete. Multiple people created many problems and I started getting phone calls right away. Review: "Asana is an excellent project management tool"
Asana is being used across the whole organization for all project management. We use it to track tasks, manage bug fixing for technical products, and stay on track to ensure no task is forgotten about, big or small. Our team has used Asana every day since our company was opened in 2015. Asana is great for any project management professional that wants to get their team up and running with task tracking within a few days. It's extremely simple to use relative to other alternatives. Review: "Asana: An Adaptable Project Management Tool"
Asana is mainly being used as a project and task tracking program. We've utilized the program specifically in our communications department to ensure our various projects stay on track. We juggle multiple print and digital communications projects that are dependent upon many stakeholders; Asana has assisted us in ensuring our deadlines are met. This includes project check-ins, setting up sub-tasks, deadline ranges, start and end deadlines, etc. Asana app could be more user-friendly, it should emulate the web program more closely. More customization for users would be nice. Smartsheet integration would be nice. Asana is perfect for our field of Advancement and Fundraising. Most of our projects are collaborations across departments involving engagement, stewardship, and fundraising. 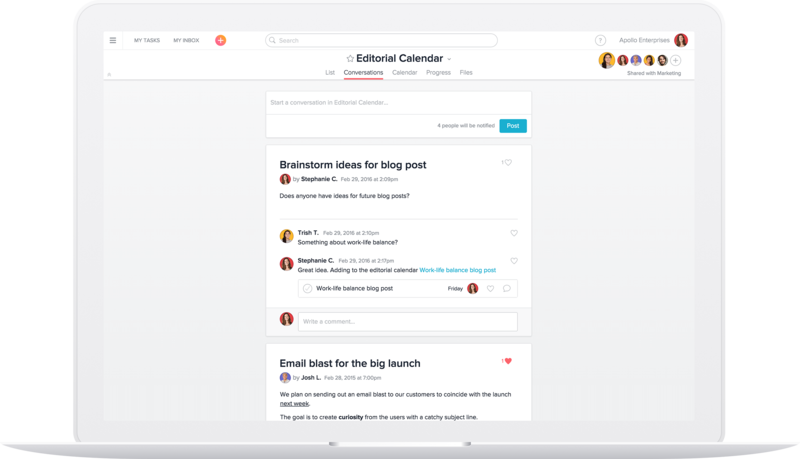 Asana helps my communications team manage our workload by keeping our projects at a glance and on task so we consistently hit our deadlines and always know what stage a project is at. Asana Review: "Great for team collaboration and task management"
We utilize Asana as our task management platform within our organization. This includes sales, operations and development teams. Helps communicate what needs to be done and what has occurred in order to complete the task. It is very beneficial when the task involves many team members and their sub tasks. Very easy to prioritize tasks and create unique tags. Not necessary to be in the platform to receive updates or populate a comment which is awesome when working on the go. Very easy to receive comments or updates from the team. Helps create workflows and prioritize tasks. Analytics can be pulled across various projects and team members. Ability to search by task content would be beneficial. Ability to see completed and incomplete tasks at the same time would be nice as an option. We can see the due date but would be nice to have a timer, such as 6 days left. Well suited for teams whom are located in different areas. We are in different locations but can centralize and engage in the same priorities. Managing long term projects is amazing in Asana as it can be easy to forget about the details. We just create sub tasks for them. User Review: "Asana - a great agency PM tool"
I work at a mid-sized digital agency that has used Asana for several years. When we first adopted Asana, I was the technical project manager. As the technical PM I was responsible for managing 20+ website projects at once as well as support tickets from previous clients. Asana was a great way to assign accountability to specific team members and assign due dates to keep projects moving forward. Before Asana, we handled everything through email. It was a nightmare trying to keep track of the status of each project and the relationships between tasks. For me, more than anything, Asana is great for assigning "ownership," which is key to actually getting things done. Though I am no longer a PM, I still use Asana daily to assign responsibilities to my team and keep track of project calendars. Fast: Unlike other PM platforms I've used, Asana is very fast. In fact, it's so fast that when you leave a comment on a task, anyone else looking at that task at the same time will actually see updates as you type. You can easily move tasks into different projects by dragging and dropping. There is no lag time between opening new projects and tasks. Everything seems to load instantaneously. Intuitive: Asana doesn't have a steep learning curve. The default view is list-based. Your team will have no problem learning how to add new tasks, use the WYSIWYG editor, or assign tasks. Use familiar commands like "@" to tag a follower on a task. Keyboard shortcuts: The keyboard shortcuts are incredibly helpful. Simply press enter to enter a new task, tab+backspace to delete, use familiar copy/paste and undo commands, and much more. PMs with a lot to juggle will appreciate the shortcuts. My Tasks: The "my tasks" view provides a single, centralized location for you to see everything on your plate. Use section headings and drag and drop tasks to re-order. I use this to prioritize my week. It helps me focus on what's really important. Searchability: The search in Asana is intuitive. Our task backlog dates back three years, and I can still almost always find what I'm looking for via a simple keyword search. Projects are archived, not deleted, so I always feel like my historical information is safe. Flexibility: Projects can be set up as a waterfall/list view or as kanban. This product should work well for teams with different styles. Integrations: Asana integrates with everything. There's a great Slack integration, but my favorite is the Instagantt integration. Using Instagantt in tandem with asana is a super easy way to create attractive digital project calendars. Emails: Asana can lead to inbox-overload. By default, you are subscribed to updates on any task that you create or follow. Updates include someone marking a task complete, leaving a comment on a task, or adding a file to a task. This means that if your coworker adds a file, makes a comment, then assigns the task back to you, then marks the task complete, you're looking at 4 emails in 10 seconds. You can always unsubscribe from emails or write rules to categorize them in your inbox, but the default setting will leave you inundated. Assigning responsibility to multiple team members: It is possible to assign a task to multiple members of your team, but I don't like the way asana handles this. Rather than assigning the one task to multiple people, asana creates DUPLICATES of the original task. This can be frustrating because it creates redundancy. Dependencies: Assigning dependencies is a new feature for asana. While it's great that this is now possible, it's pretty clear that it's not a focus for the software. The dependencies don't show up clearly in the list view, though they are obvious within the task view. Overwhelming: This is probably more of a governance issue for my team specifically, but our Asana has gotten overwhelming. I count the flexibility of Asana as a pro, but it does come with risk. The lack of rules and controls leads to a "wild west" situation where anyone can organize tasks, projects, templates, etc. anyway they want. We have some team members organizing all their tasks by team function, others organizing tasks by project, others using entirely separate Asana workspaces, etc. Overall, despite its drawbacks, Asana works really well for our team. I think this is an appropriate [tool] for a mid-sized digital marketing firm, like ourselves. A software development team is going to want something more robust, like JIRA. However, if you're just shopping for an easy-to-learn tool that will help you manage responsibilities without relying on email? Asana is perfect. Its flexibility also makes it a great fit for most work-flows in almost any industry. Asana is simple out-of-the-box, but it does have robust functionalities that will allow your team to ramp up if desired. Review: "Asana is the best project management platform ever!" I use Asana to organize the different projects of each of my clients and the task of each of my employees. It allows me to track the progress of each project especially when it comes to completion of task and sub-task. The ability to put due dates and hierarchy of urgency of each task allows us to see which task we should focus on first. I can easily manage the projects and my team through Asana. The comments feature in each section, task and subtask allow all the tag people to view the questions and comments of the assigned team members. The calendar feature is pretty cool too since I can view all the due tasks of the day and I can easily follow-up with the assigned team members. Overall, it keeps the project fulfillment smooth and easy. It's not that easy to change or update the name of the title. You need to click the arrow down button beside the title to edit. I believe it should be easier like just click on the current title and change it. I would like Asana to put a feature like Facebook and LinkedIn where you know who's online and who's not online. Because if the person-in-charge is online you can communicate with him real time rather than waiting for him to respond later on. I would be glad too if they add a voice call or video call feature so that if you have concerns and the person you would like to talk to is online you can speak with him right away. Some comments or revisions just needs to be explained through a call to eliminate misunderstandings. Asana is very suitable for creating milestones for app development, web development, marketing projects, lead generation projects, project fulfillment and tracking the progress all the goals and targets of the team. It less appropriate for tracking sales, storing customer details, software development (JIRA is more appropriate for this). I will highly recommend Asana to start-ups as well as corporate teams to organize their workflows very well. User Review: "Asana is great for your A team!" Asana was being used as our primary task tracking software after we switched from Basecamp. We were only using a task tracking software for our marketing department but then decided to switch to Asana when we wanted to integrate more departments into the mix. Asana has helped us keep a larger number of team members more organized than we were able to with Basecamp. Asana is great at keeping a slightly larger group organized and on task. It is a great "to do" list, I love checking item off when completed. And call me a millennial, but I love that you can turn on those cute animations as a reward for each task you check off. Right now we're migrating from Asana to Monday. In comparison, Asana seems like it is MUCH more basic than Monday. I'd say, it would benefit Asana to implement some of the capabilities which Monday offers. I'd say Asana is appropriate for small to medium sized teams/companies/departments. Our needs have grown and as such, Asana just can't fulfill some of those needs. We have a lot of people working remotely so it still offers the benefit of keeping everyone on track but we need something that offers better real time communication almost like a messaging service. Asana: "If you are just starting, this is how you collaborate." We start the lifecycle of the product using Asana, Designers are assigned tasks to create wireframes and minimal designs which are uploaded and linked to the group with checkboxes. This is then passed on to following teams, and the process continues until testing. Commits on one place can reflect here. Ability to let the whole team know what page other developers are on. The starting package can have more number of minimum users. Integration with UI tools like Zeplin, sketch, and terminal can be added. Well suited - For smaller products, while designing an MVP. Less appropriate - Bigger product with too many members. Review: "Asana - Taking our Design Team to the next level!" Several departments within our company use Asana. Each in a varying capacity. Our design team uses Asana to organize everything from basic ideas to fully approved designs. It is so nice to be able to log on and quickly identify the status of a project, who is assigned to it and any updates you may have missed. Also, the assigning of tasks to individuals is very convenient and eliminates any opportunity for miscommunication or doubling effort resulting in mistakes or wasted time. It is very visual which is extremely user-friendly for the environment in which we use its capabilities. Multiple users can access the program at once without stepping on each other's toes or having to wait until someone is out a project to add something. It is definitely a group friendly program. We like how visually pleasing it is. It is not at all intimidating to first-time users as it is very user-friendly. You can quickly find what you need and become comfortable with its features and functions. I personally like being able to assign different tasks to different employees and be able to receive feedback and progress directly from that assigned person as well as view it myself. I personally have not found anything that I would recommend at this time. However, I have noticed that the older generation of employees struggle with its style where the computer savvy and younger generation thrive. I have no idea how Asana could overcome that obstacle. If you have a team of employees that you would like to view their progress, assign different tasks to various employees based on their specific talents or qualifications and have all projects tracked while doing so, this is the program for you. It has options to hold ideas, images, mood boards, as well as your products being developed and put on the market. It keeps everyone in the department up to speed and not just the one person in charge of it and their supervisor. Asana Review: "Excellent Collaboration tool"
Most of the projects are managed through Asana. This allows us to organise and plan out our current a future workloads. It also allows us to easily provide customers with updates based on the progress of their project and any task outstanding. We can use the template feature to recreate the projects and update the specific tasks as necessary. I can keep track of everything that's happening with my project in a very simple way. It is simple to use, great looking dashboard. Asana has the right amount of features for people looking to add to their regular to-do apps. The Android application contain all the basic functions. However, it's much more convenient to work from the desktop. Asana is a great tool even if just used at a basic level. However there is lot of added benefit from spending time learning all the additional features that can be used and turn it into a very powerful project management tool, such as task dependencies, recurring tasks, sharing tasks between multiple projects etc. 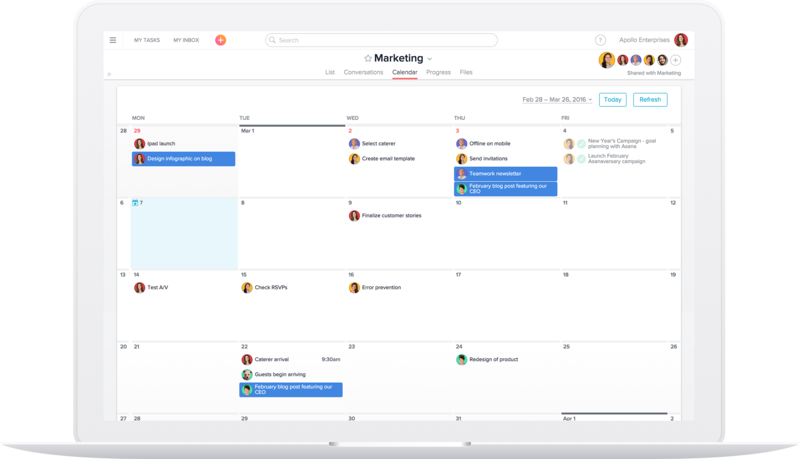 Asana Review: "Great for task management"
Our entire marketing team uses Asana for tracking and managing almost every project and task we do. Great for keeping track of projects and tasks. Dependencies are really useful as well. You can mark certain tasks as being dependent on other tasks. You can also create project timelines which are great for visualizing the lifetime of a project. There's a lot of stuff that gets lost in Asana. Sometimes you really need to be able to keep files in a universal place and not have them get lost in a task or subtask of a task. In that regard things can get confusing sometimes. Great for task management. But must be used in conjunction with services like google drive and an internal knowledge base. Asana Review: "Best tool for productivity enthusiasts." Well designed for managing team projects and workflows, Easy to handle task management. The board system is really useful and its great to handle activity tracking of employees. Mobile app is very easy and nice UI. Team project and Workflow maintenance. Create customized lists of tasks and reminders. Project management with a large team. Review: "Asana - a bit complicated, but does a good job"
It's being used as a task management and project management tool. Its easy integration with Gantt charts has made it very suitable to our company's needs. Creating tasks, assigning them to different people, setting deadlines, uploading files, leading discussions on every thread are just some of the features that the platform offers. It's very easy to learn how to use its basic feature and start working with it straight away. It could be used for company, as well as private projects. Different teams can create individual channels and invite any team member to their respecting team. Adding the option for a chat on the platform would be great. It's very complex and in order to use all specific features, everyone needs to watch all tutorials, which is time-consuming. Most of the time I find it difficult to find what I am looking for just because there are sections, subsections, project names, etc. It's well suited if the company is willing to organize a training for all the employees, so they could use all the features of the platform. In case just a simple task management tool is needed, Asana is not suitable, as it is too complicated. Asana Review: "Good if you successfully implement it"
We use Asana across our entire company for all projects, including recruitment, product, and internal operations. This platform is primarily leveraged by our younger associates and managers to track and assign projects, although our whole team is set up and has project assignment on the platform. Our more senior managers and executives do not use the platform because forcing behavior there is too hard and the platform is too complex to onboard them. Asana is well suited for small to-do tasks and for managing up by assigning tasks to peers/ managers. It is less well suited for larger tasks, as the subtasks feature is not well tailored. It is also hard to use across a less tech-savvy team, as the layout is not terribly intuitive and doesn't follow any existing platform format. User Review: "Project Management with Asana"
We use Asana organization-wide, it has been our saving grace when working to outfit tradeshows and management of everyday projects. We love being able to see open and closed tasks and communicate between departments to ensure that all information for a project is available to all and stored in one location! Allows for uploads of attachments so all relevant back up is available. Timeline and meeting scheduling and reminders all in one place. You can clearly see what tasks have been completed and what is still outstanding. The ability to remove a member from a project even if you didn't start the project if an employee leaves the company. Asana would be useful to any organization from corporate offices to restaurants, for task list keeping or supply orders, across the board, it's a great platform. Asana Review: "Amazing Tool for Optimal Productivity"
In my previous job, we used Asana across the Marketing department. In my current job, I and a few others use Asana. Asana is an amazing project management tool as it allows you to create your to-do lists but also offers the ability to upload any files relevant to that specific project. It's easy to tag and assign tasks to colleagues, create multiple projects and keep them organized, in addition to collaborating across many departments without getting confused. Asana Review: "Digital Manager for the Digital Age"
I worked as a marketing consultant for some time and was able to manage up to ten projects with Asana at the same time. This service helps to virtually eliminate working with e-mail and work much more efficiently. People in my team know exactly what to do and when to do it. My clients know exactly what is happening with their projects. And I know how to plan my day. Communication is directly related to tasks and results - this is really important. Free of charge, if you do not need to run a large team into the project. Review: "Asana is the queen of project management"
For my internship, it was used to assign editorial tasks. For my current job, it is used to assign tasks to various team members on various projects. Typically, the project manager does this, but if someone in another department needs to assign something to someone from another team, this can be done by any employee. It usually helps with any urgent tasks that anyone needs to outsource to another team, and lets people know what something needs to get done ASAP. Keeps an organized list of what needs to get done. Great tool for project managers to use to consolidate things into one interface. Some of the features seem unnecessary, like the conversation one seems redundant, and the calendar, it's said in the task itself when it is due, no need to have calendar. No need for an inbox when are tasked things, and they show up in your "my tasks". Having an aggregated source of information in one place, it is a great tool for project managers, and team members to get things done more efficiently. It probably wouldn't be an appropriate place to have discussions, just because it will feel crowded with commentary and chats. Asana Review: "Super-Powered To Do List!" We all use ASANA to organise tasks within all work we do. It's the first thing to look at in the morning to organise your day. Because our small but growing workforce operates in several different locations an hour or two apart, ASANA helps us be a coordinated team. Organise multiple projects simultaneously - for a startup this is so important because everyone has to pitch into a lot of different areas. Headings within tasks helps a lot! Keeps a complex project organised. We tried integrating a time keeping app to ASANA. It was fine but the truth is we didn't remember to start or stop the timer. What we really need is an easy method to estimate how long a task took right there in ASANA -- nothing too elaborate. We would need to be able to download the projects and see how much time was spent on the whole project added up from the tasks within it -- the individual task times don't matter so much as time spent on a project by all working on it within a week or month. Prioritising your day! I love to have a tick list of tasks to complete and deadlines for doing so. I did this in my notebook until ASANA came along to our office. Now tasks aren't so easily forgotten and they are kept up to date. 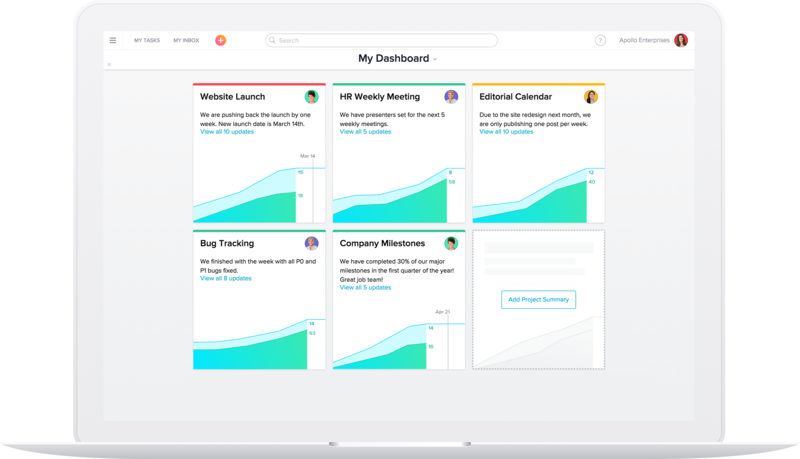 Asana is a web and mobile project management app that according to the vendor, goes beyond typical PM software by enabling teams to track everything they're working on. With tasks, projects, conversations, and dashboards, Asana lets an entire team know who's doing what by when in order to help companies get results. 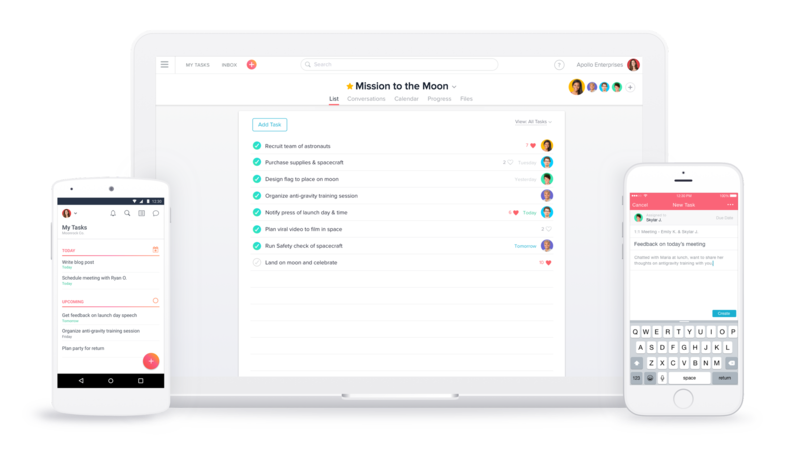 Asana can be used for meetings, launches, or campaigns. Users can also add integrations for GANTT charts, time tracking and more. Asana is available on the web, iOS, and Android devices.